There are occasional situations when creating an artificial vignette effect can help an image. This was the case with this image and it may be more common in similar situations which can be lumped together as “intimate landscapes”. These are typically small scale landscapes. The kind Elliot Porter pioneered. A vignette should be subtle. It is a bit strong in this image for demo purposes. It may help to draw the attention to the center of an image where the action is and make it harder for the eye to accidentally ‘wander off’. There is a quick way to do this in PS CS 5.1. With the image open, go to the 'Filter' panel > Lens corrections > Custom (at the top.) In this custom drop down box, near the middle is the 'Vignette slider'. Dial in a vignette until it looks fine, then click OK. This is the same slider that can be moved in opposite direction to fix unwanted vignette caused by lens design issues. This was a shot taken in Georgian Bay. 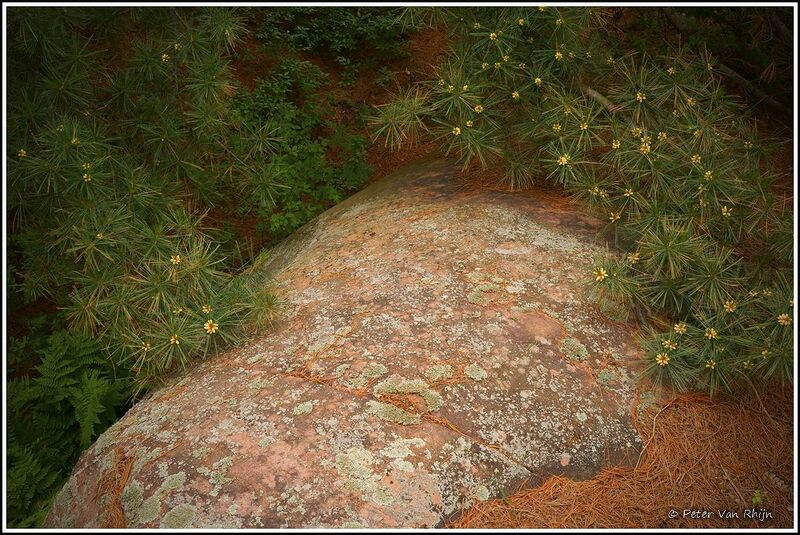 It shows the white pine during the time its pollen floats on the water surface like green (but healthy!) scum. Sony ILCE 7R with 24-70 Zeiss Vario Tessar at f20, ISO 400, 1/15th sec.